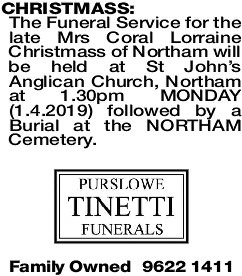 The Funeral Service for the late Mrs Coral Lorraine Christmass of Northam will be held at St John's Anglican Church, Northam at 1.30pm MONDAY (1.4.2019) followed by a Burial at the NORTHAM Cemetery. Passed peacefully at Bethavon on 24 March 2019. 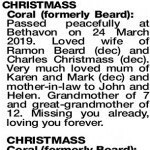 Loved wife of Ramon Beard (dec) and Charles Christmass (dec). 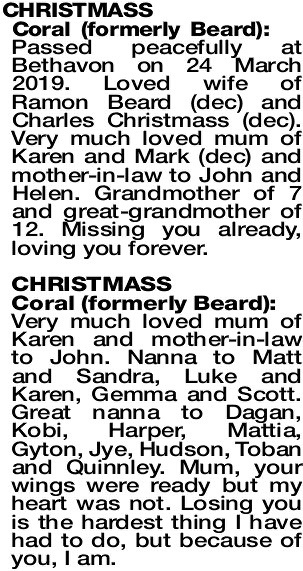 Very much loved mum of Karen and Mark (dec) and mother-in-law to John and Helen. Grandmother of 7 and great-grandmother of 12. Missing you already, loving you forever. Very much loved mum of Karen and mother-in-law to John. 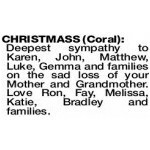 Nanna to Matt and Sandra, Luke and Karen, Gemma and Scott. Great nanna to Dagan, Kobi, Harper, Mattia, Gyton, Jye, Hudson, Toban and Quinnley. Mum, your wings were ready but my heart was not. Losing you is the hardest thing I have had to do, but because of you, I am. Loved Sister-in-Law of Ramona. Deepest sympathy to Karen, John, Helen and families. Fond memories of days gone by. 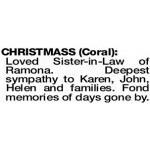 CHRISTMASS CORAL Deepest sympathy to Karen, John, Matthew, Luke, Gemma and families on the sad loss of your Mother and Grandmother. Love Ron, Fay, Melissa, Katie, Bradley and families.